The story I'm going to tell you isn't well known since text books do not normally tell us everything about the events leading up to historical facts, but they exist and some of us want to know more, refusing to settle for the simple details explained by some books, and that is why I'm going to tell you about how the Caspe Agreement came about. 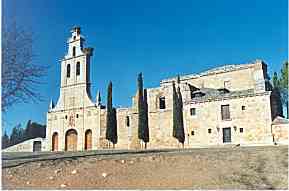 The most outstanding history of Ayllon was in 1411. The King of Aragón, Don Martin I, 'El Humano' ('The Human King'), had died without leaving an hier. The kingdom was in crisis and there were various claims to the throne. Don Jaime, Count of Urgel who was married to one of the daughters of Peter III; Don Alfonso, Duke of Gandía; Count Foix who was married to Princess Juana of Aragon; Don Fadrique, legitimate son of Don Martín de Sicilia and therefore Martín III's grandson; Don Luis de Anjou, Duke of Calabria and Don Fernando, Count of Trastámara, also known as Count of Antequera, son of Juan I, King of Castilla and whose mother was Doña Leonor, another of Pedro III's daughters. Don Fernando was the closest relative, since Don Fadrique's claim to succeed the Catalan-Aragonese throne had not been established, and furthermore, he was famous for his victories in Andalucía and for the conquest of Antequera, where he earned the name 'de Antequera'. Meanwhile, men of good will tried to get the Courts of Aragón, Catalonia and Valencia to reach an agreement. Unity had to be preserved and therefore, an agreement which would solve the problem of anarchy was necessary.The agreement involved naming nine delegates, three for each of the confederate kingdoms, who all met in Caspe. Meanwhile,political scheming resulted in Don Fernando moving to Ayllon, along with Queen Catherine of Lancaster and her nephew, King Juan of Castilla, and Don Juan II, who moved from Riaza on the 16th of July, 1411. A few days later, the great miracle-worker, Saint Vincent Ferrer, arrived from Toledo and stayed at the Convent of Saint Francisco, called for by the King and Queen. It is rumoured that he preached before them and advised them that Jews should live in separate quarters from Christians. According to Vergara in 'The History of the Distinguished City of Segovia' (The Diego de Colmenares Institute), " On the 16th of July, 1411, King Don Juan II and Queen Catherine met Don Fernando de Antequera, Lord of the town, in Ayllon, and received an ambassador sent by Carlos, a nobleman from Navarra, and a visit from Saint Vincent Ferrer". This entry refers to Don Fernando as Lord of the town of Ayllon. The decision to choose Don Fernando de Antequera in the Caspe Agreement was due to his strong personality as a politician and a soldier. Could it have had anything to do with these meetings? It is possible that destiny was forged at them because Saint Vincent Ferrer was his most tireless defender. 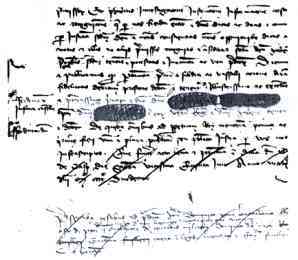 In the Caspe Agreement, a fragment of the first draft of the certificate of election produced by the delegates who chose Don Antequera and dated in Caspe on the 5th of June, 1412, shows Fernando's name has been rubbed out by some chancellary civil servant and then later, added in the margin.